So you’ve taken the first steps toward a career in fusing metal and enrolled in welding school. Wise decision! 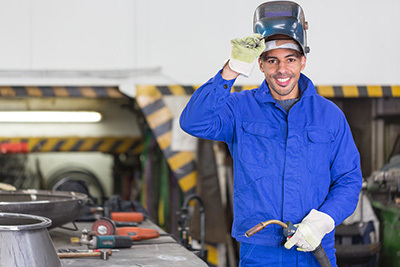 Formal welding training makes your chances of landing a job much likelier. But becoming a metal master is no small feat. Cutting, bending and bonding steel parts doesn’t require just strength, but it also demands a tolerance for massive amounts of heat and open flames. When the sparks fly, you need to be ready. Before you even pick up that torch or welding gun, make sure you’ve checked these 3 precautions off your list. Before you suit up to weld, sit down and read the operating manual for your welding machine. Understanding how to use the machine properly does more than help you produce your best work: it teaches you how to operate it in the safest way possible. Protect your arms, wrists and hands from stray sparks or splatter with a good pair of fire-resistant gloves. If you’re doing a lot of MIG and stick welding, opt for a heavy-duty pair. TIG? Try some that allow for greater dexterity. Whatever gloves you choose, know their limitations. Reach for the pliers to pick up freshly welded workpieces to avoid burns. Welding Jacket: Look for pigskin leather, flame-resistant cloth or other lightweight options to keep cool and safe while you work. Welding Apron: Shield your upper body from sparks with a fire-resistant welding apron. Long Pants: Heavy jeans will do the trick. Just make sure not to cuff them at the bottom, and keep butane lighters or matches out of your pockets. Pants should fit well and not go over your shoes. Long-Sleeved Shirts: Make sure to button collars, front pockets and cuffs to prevent sparks from entering. Select materials that are tightly woven. Leave the sneakers at home—unless you want to feel like you’re walking on fire! Instead, go with a pair of steel-toed, high-top leather work boots. Protect your face and eyes from the harmful UV rays of the arc by wearing a welding helmet fitted with the right shade filter for the job. You can check the Occupational Safety and Health Administration’s (OSHA) guide to select the appropriate lens shade for the application. Generally, the higher the number of the shade, the darker the filter and the greater the protection from light radiation. Repeatedly lifting a traditional helmet and then flipping it back down to inspect weldments can cause fatigue and neck strain if working long hours. While auto-darkening helmets tend to be pricier, they adjust the shade from light to dark and back again, so they can be worn at all times. Reduce the risk of getting grinding fragments, slag chips and grinding bristles in your eyes by wearing safety glasses with side shields or goggles. All face and eye protection should be ANSI Z87.1 compliant. Properly ground all welding equipment before you start working to avoid electrical shocks. Make it a habit to check ground connections on a regular basis. Make sure the floor is dry before working. Consider standing on a dry plywood for outdoor work or a dry rubber mat for indoor projects. Prevent trips and falls by having a designated place for all equipment and materials and keeping them there. Open windows and doors to allow plenty of fresh air in. Use a personal respirator if working in closed, confined spaces. Unlike traditional universities, welding schools typically teach students the trade through mostly hands-on instruction. This means you’ll have plenty of chances to operate welding equipment and practice your future profession. Following the above welding safety tips can help ensure a safe start to the school year. Where could you take your welding skills after graduation? Read Where Are All the Welding Jobs? These States Have the Highest Employment.